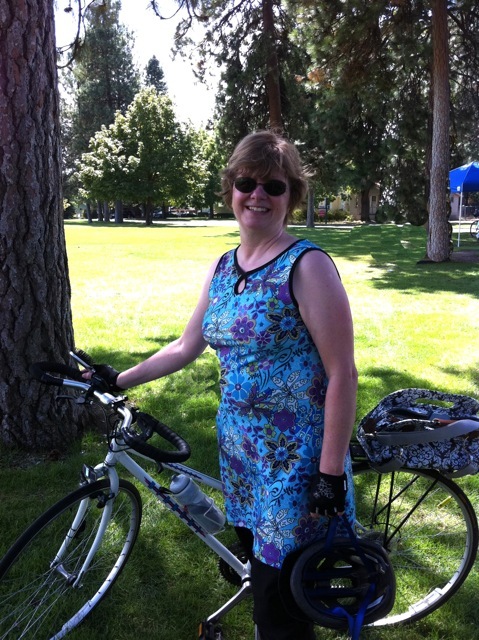 Wilma wearing the Ruu-Muu she got for a biking vacation to The Netherlands, at the August Spokane Summer Parkways. I work as a librarian for Spokane County Library District. I also volunteer at Spokane Public Radio, at my daughter’s school (currently Lewis & Clark High School), on the City of Spokane Bicycle Advisory Board, and with my church. I like things that are rhythmic and go round, because besides bicycling, I love to knit socks, and I’m learning to spin my own yarn. I have always loved to ride a bicycle. However, in 2007, I visited The Netherlands with my husband and daughter, and was completely blown away by the bicycles and the infrastructure. My husband and I spent some time touring around Amsterdam on borrowed bicycles, and it was so much fun that I instantly became obsessed! 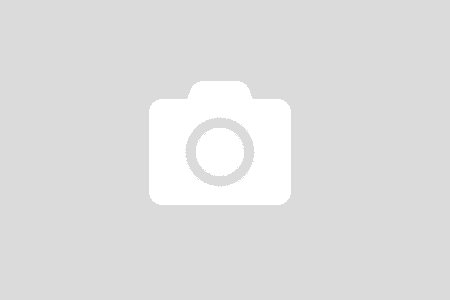 Tell me about your bike(s) and accessories. I think I got my first bike in about 3rd or 4th grade, but I saved for and purchased my first brand new bicycle, a 5-speed Schwinn Suburban, when I was a high school junior. It cost $85 in 1972! I still own that bicycle, but only ride it very occasionally. It’s heavy, and hard to shift! When I first moved to Spokane, it was just before Mount St. Helens erupted. I had just purchased a brand new car, and after the eruption, I was afraid to drive it in the ash, so I bike-commuted to the library (about a mile each way) for most of the summer of 1980. In 1990, I met my husband, and he convinced me I should have a better bicycle, so I bought my Bianchi Advantage, a pretty white mixte 21-speed. I didn’t know much about fit, and the shop didn’t really do much for me, so that bike caused me a lot of wrist and neck issues. However, I used it for some touring, and really enjoyed pulling my daughter, first in the Burley d’Lite trailer, and later on the Piccolo tagalong to playgrounds and to and from daycare. In 2005, I got my third bike, a 24-speed Electra Townie. It was super easy to ride, with flat-foot technology, easy step-through frame, and twist shifters. I added fenders, colorful Dutch bike bags (from Basil) and just rode everywhere. I got brave about riding up and down the South Hill, so I was able to use it for commuting out to the Valley for work, as well as shopping trips to the Valley Mall. I rode it up to fifty miles at a time. When my husband challenged me to ride STP (Seattle to Portland) in 2010, I considered doing it on the Townie, but was told that this would be very difficult, because there aren’t options for changing position, and it is a slower bike than a road bike would be. I shopped for a road bike, but didn’t find anything I really liked (I wanted something that could accommodate a rack, so that I would be able to carry a few supplies), so ultimately, a friend helped me revamp the Bianchi, by putting road tires on it, and switching out the handlebars for something with more positions for my hands. I chose butterfly bars, because I’m not fond of drop bars. Nowadays, I mostly ride the Bianchi, but I’m dreaming about an A-Line, which is a semi-custom bicycle made by Natalie Ramsland, Sweetpea Bicycles. Either that, or getting a real Dutch touring bicycle, probably a Gazelle. I mostly ride for transportation. I bike commute when I can, which is at least once a week, and I do most of my grocery shopping using the bicycle. I have also found that it’s a lot more convenient to do errands downtown with the bicycle. I never have to pay for parking that way, and can almost always find a place to park right next to the business that I want to visit. I also love day-touring. I love to ride the local trails, the Centennial Trail, Fishlake Trail and Trail of the Coeur d’Alenes are favorites. Our family vacation this year was back in The Netherlands, where we did a week-long barge and bicycle cruise. Every day we rode our bikes from the place where we spent the previous night to the new place where the barge was moored. There were fifteen people on the barge, along with three crew to take care of us and guide us each day. It was really a terrific way to tour, and I can’t wait to do it again! People ask me about the Basil bike bags, which I got through Amazon. I see them around a lot more nowadays, so I think more bike shops must be carrying them. Lately, I’ve been enjoying my Po Campo bag, but nobody has asked about that yet! I mostly wear ordinary clothes. I don’t like the feeling of padded shorts, unless I’m going a long distance, so I usually wear capris or longer shorts in the summer, or semi tight jeans when it’s colder. I wear t-shirts or a sweatshirt, depending on the temperature. If I’m going to church, I’m quite comfortable dressing in a skirt or dress. That is one of the benefits of riding a step-through or mixte frame. I do have one NuuMuu that I’m extremely fond of, and a couple of jerseys made by Terry that are really comfortable as well. Last year I acquired a rain jacket from Cutter, made of Event waterproof fabric that is fantastic. It is totally breathable, but also very waterproof, so when it’s wet, I can ride without getting sweaty! What things do you wish were different about your bike and gear or women’s clothing or both that would make it easier to bike and look good, if this is something you give any thought to? One of the reasons I am thinking about getting a Dutch bike is because that would make it possible to ride in any kind of weather, and in any kind of clothing that I want. Standard equipment on most Dutch bikes include rear rack, chainguard, skirt guard, drum brakes, front and back lights, and step-through frames (in The Netherlands men use them as much as women because of the ease of entry). When you buy a bike in The Netherlands, everything comes standard. You don’t have to add a bunch of stuff to make the bike work for you. You can get more or less deluxe bikes, but all of the necessities are there no matter which model you choose! What does Spokane need to make it an even better place for women to ride their bikes? More bike paths would be outstanding, but if that’s not possible, more bike lanes would do nicely as well! It would also be wonderful if there was a bike shop that catered especially to women riders of all ages and abilities. Finishing STP last summer was a something I never dreamed I could do, so I was very proud of that. However, just using my bike as a means of getting my transportation accomplished is something I’m proud of every day! What one word describes the way you feel most often when you ride? What question didn’t I ask that you really want to answer? How many bikes should one woman own? Bonus: Wilma made this video of one of her bike commuting routes a couple of years ago. Part of the route at 57th/Hatch is much improved today; there are new bike lanes on 57th. 30 Days of Bike Commuting: You Can Do It! Ride with your Community: SpokeFest Rocks! Falling Down on Your Bike. It Happens. To Grown-Ups. Pretty Handy, Gloves. The Blogspedition Assumes You’ll Get ‘Em. What to Wear for Your Bike Commute? Clothes. 30 Days of Biking: Week Three! 30 Days of Biking: Final Report! Bike to Work. Bike to Eat. Bike to Shop. Bike to Everything.